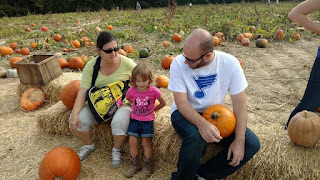 Today a big crew of us went out to Braeutigam Orchards near Belleville, Illinois for some pumpkin picking. We were initially thinking about going back to Eckert's like we did for peaches but it was decided that that place would be too crowded. Let me tell you Braeutigam's had a few people at it as well. The Braeutigam Orchards website says that the farm has been in the family since 1831 and they are now on their eighth generation of berry pushers. We got some exotic-to-me variety of squash called sweet dumpling. They were sort of like acorn squash but were white on the outside, smaller, and sweeter. They were selling pumpkin and apple cider donuts and I just couldn't decide so I didn't. After seeing this sign I'm a little concerned about what type of fruit-shy monster is lurking in the woods of southern Illinois. The fields were a lot more varied than I had imagined. There were all sorts of weird specimens out there. They were like heirloom pumpkins. Our character was tested out in the fields that day. Even some of the best of us succumbed to pumpkin greed. Some of Katie's family was in attendance. I stole this picture from Katie's Facebook page. Sorry not sorry. I tried to tell the gang that I had just been to a winery tour yesterday but they were like "no we're going to this winery and if you don't drink some we're going to kick a puppy." I had no choice.